3G - Stainless Steel Handles with a measure or graduation on the reverse side. Fitment No.3. for Blades - No.6, 9, 10, 10A, E/11, 11, 11P, 12, 12D, 13, 14, 15, 15A, 15C, 15T, 16, 40 and SG3. 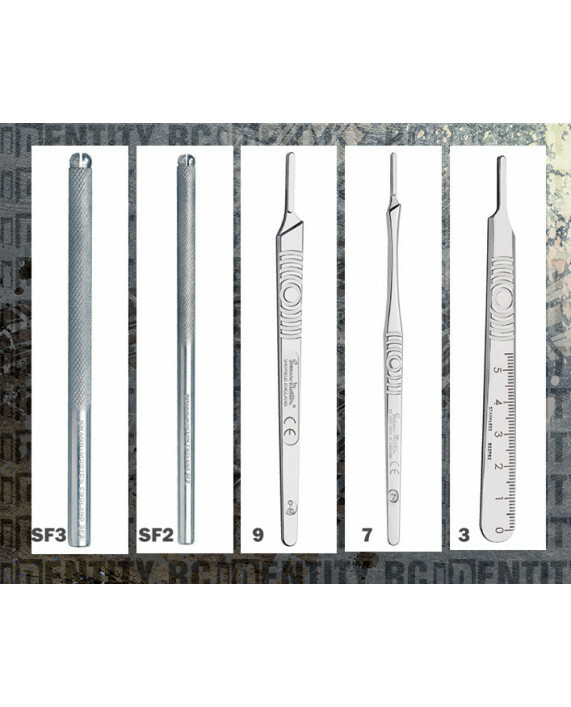 #7 - The slim elongated Stainless Steel No.7 Fitment No.3 Fits Blades - No.6, 9, 10, 10A, E/11, 11, 11P, 12, 12D, 13, 14, 15, 15A, 15C, 15T, 16, 40 and SG3. #9 - The short slim No.9 Stainless Steel.Fitment No.3. Fits Blades - No.6, 9, 10, 10A, E/11, 11, 11P, 12, 12D, 13, 14, 15, 15A, 15C, 15T, 16, 40 and SG3. SF2 - Fitment Fine. 2 Piece handle. Fits Blades SM61, SM62, SM63, SM64, SM65, SM65A, SM67, SM68, SM69, SP90, SP91, Myringotomy blade. SF3 - Fitment Fine. 2 Piece handle. Fits Blades SM61, SM62, SM63, SM64, SM65, SM65A, SM67, SM68, SM69, SP90, SP91 and Myringotomy blade.